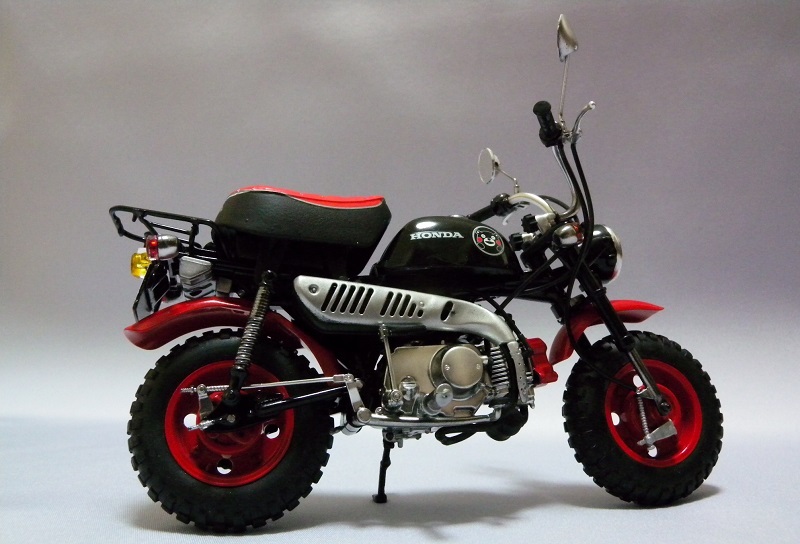 The Motorcycle GB this year will be Japanese Motorcycles, and starting March 1st you can start posting your wips here. Looking forward to seeing what everyone has planned. Thanks for setting this one going Sam. Much appreciated. Going to join in with this one with one of these two, just not sure which yet!! 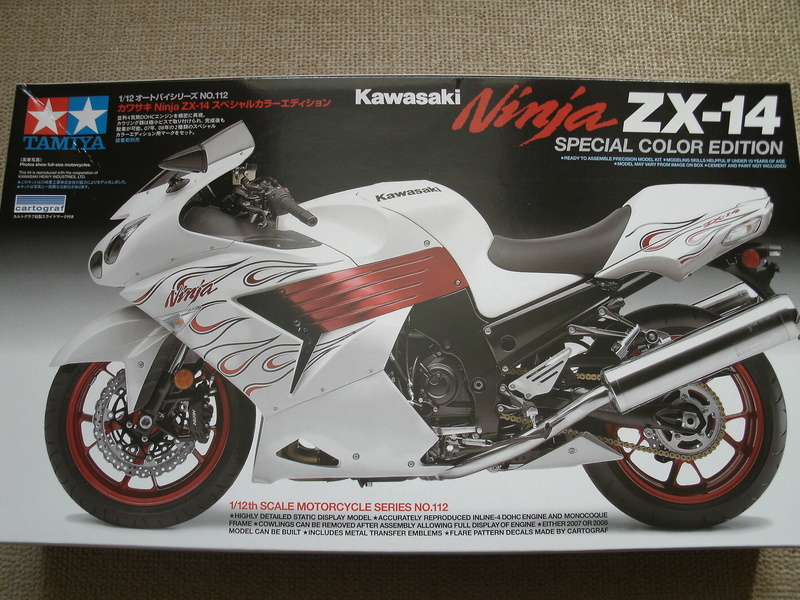 The first one I bought but the second one was a kind gift from Mr Hirakawa when we first met. 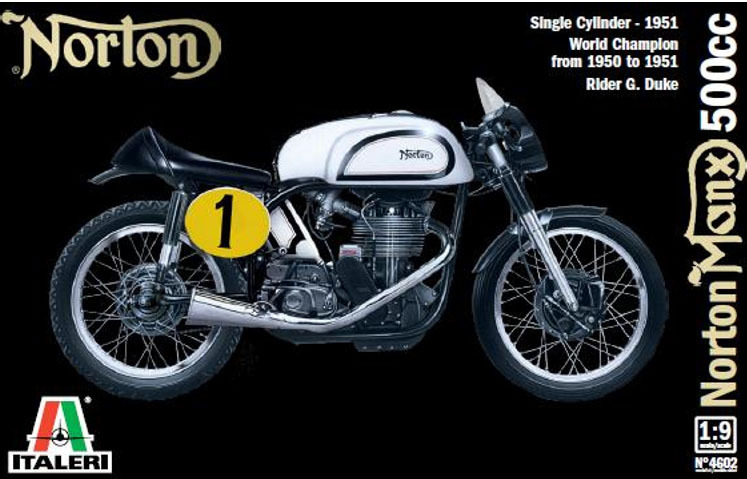 how long has Nortons been made in Japan??? 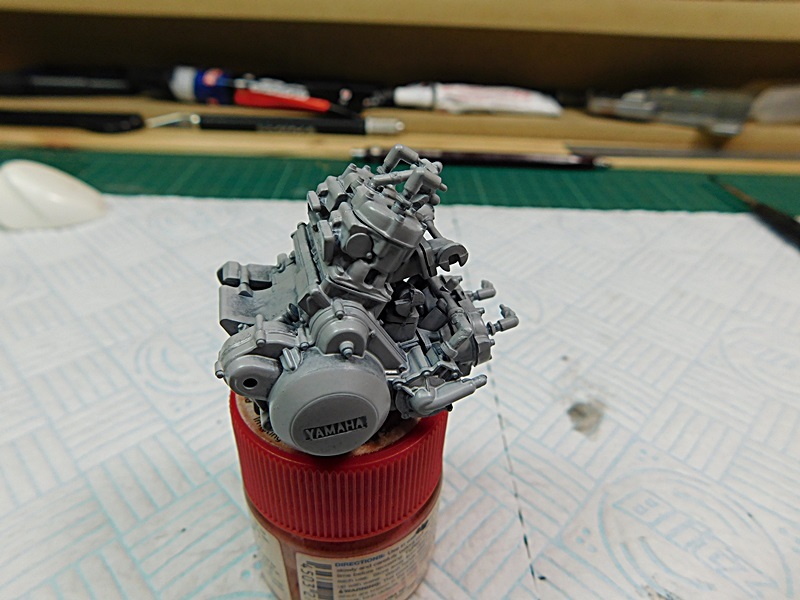 i really want to join in but im still on a building embargo.....if i do get the bench together i will have to pick something up cos all the bikes in the stash are either british or italian! Japaneses copy don't you know. Whoops!! LOL. Guess that's made the decision for me then!! 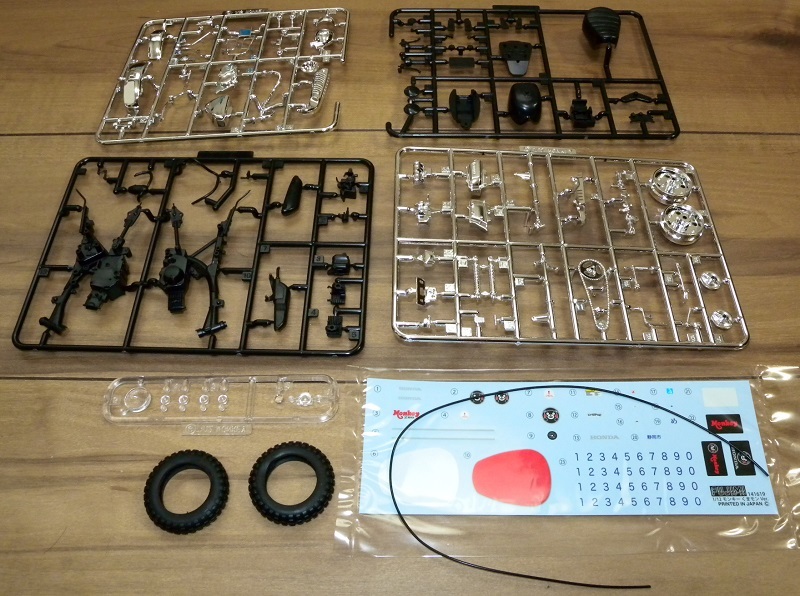 I will be putting this together for my mother-in-law. She loves the character "Kumamon", which is the mascot for Kumamoto prefecture, here on the island of Kyushu. Kuma 熊 is bear. 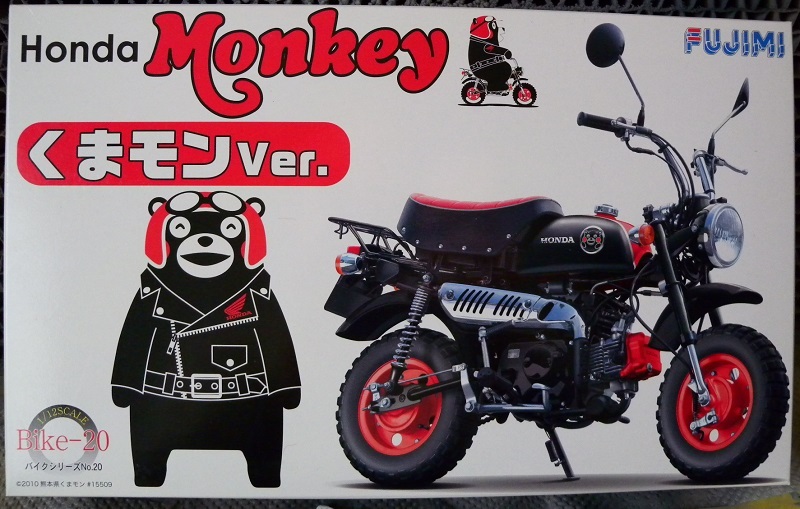 Hmmm.... a bear riding a monkey? An excellent choice 2whl. 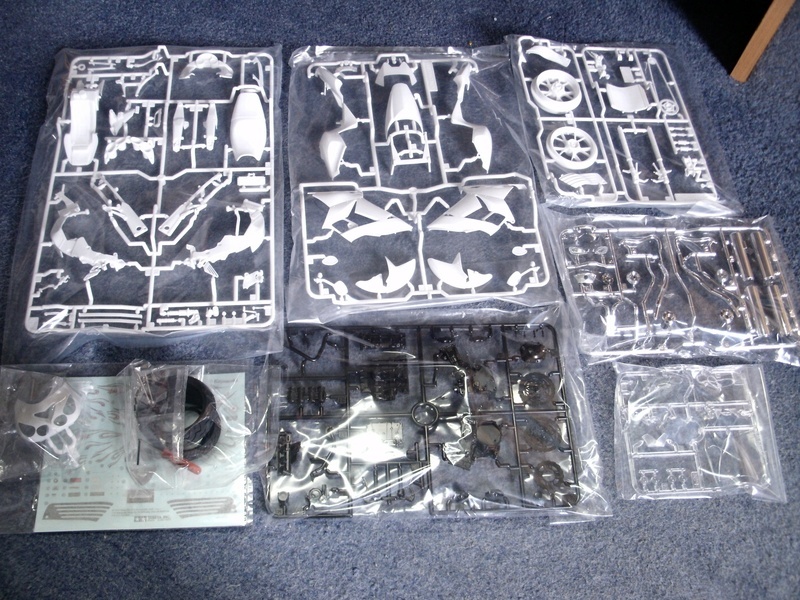 Really looking forward to your build. Howdy all, some great kit choices here. 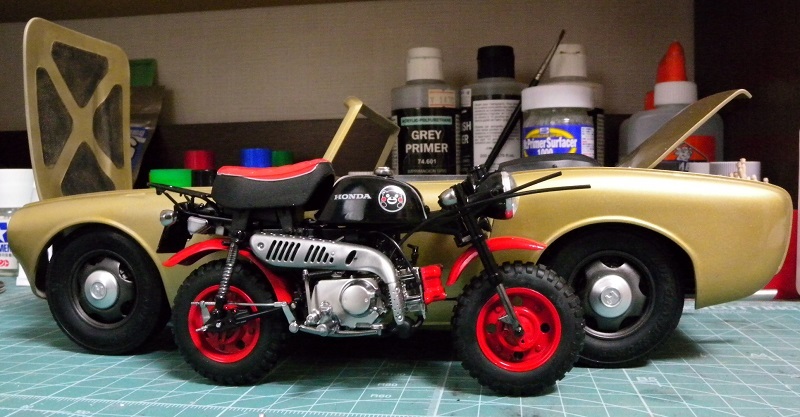 I build mainly 1/25 or 1/24 scale (some smaller) due to time and space limitations. 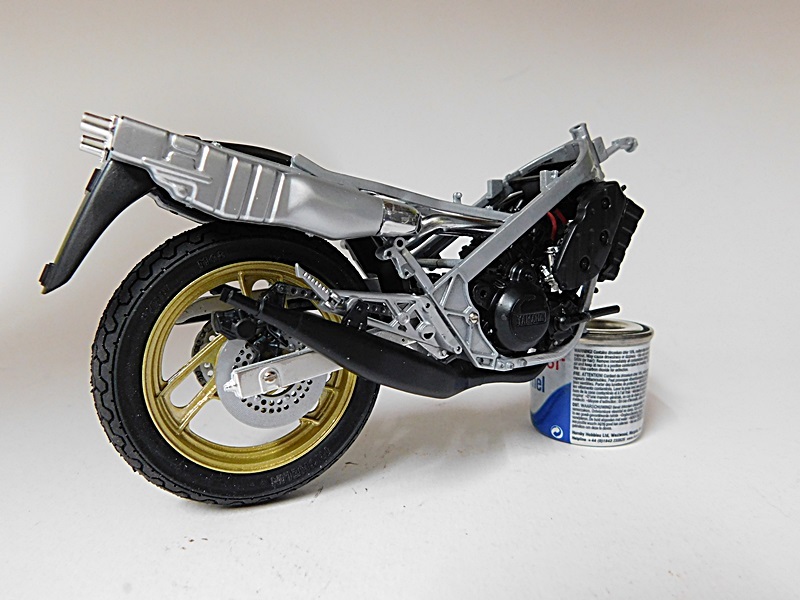 I picked this kit up as part of an ebay junk lot so I'd thought I'd jump into the build with a re-do of a 1/25 Yamaha 250 (at least I think its a 250) glue bomb. 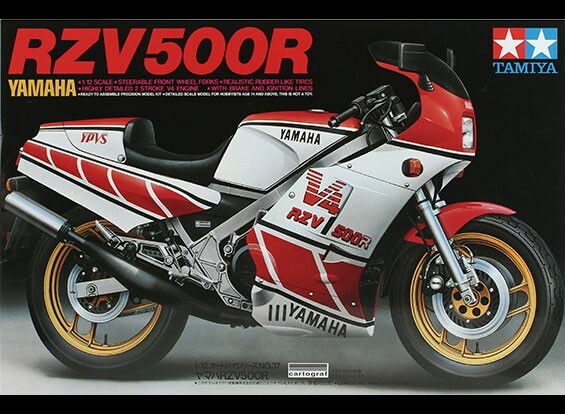 If the plan comes together, this will be a companion for the upcoming truck build. Chris: Now you have something to work with. 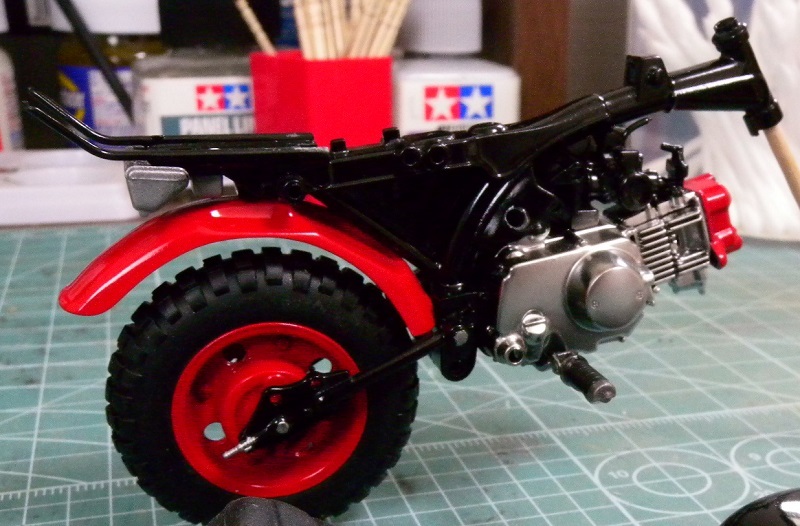 The first assembly consists of the frame, engine, rear wheel, and foot pegs. 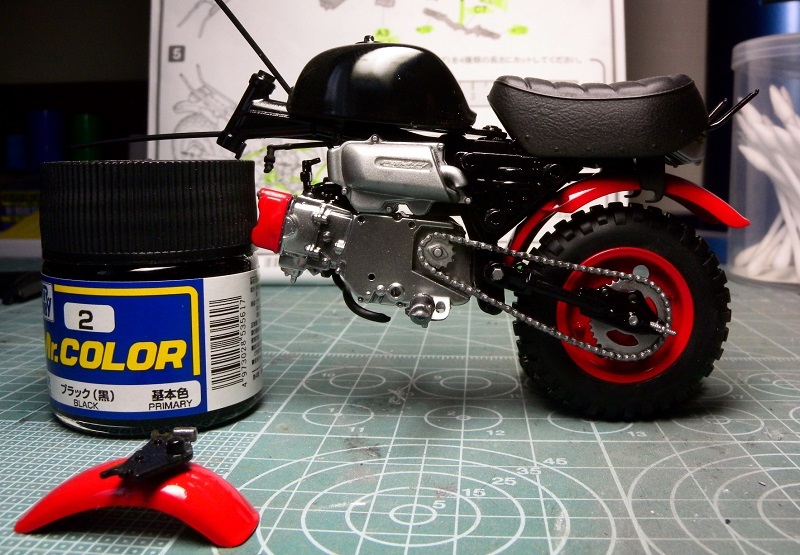 For a kit this size, it offers good detail. Also, the fits are very good. 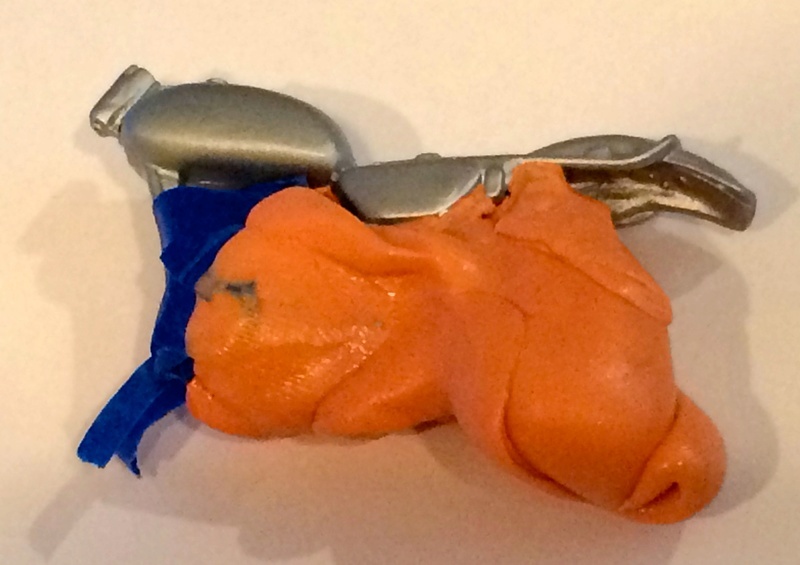 Some parts actually snap neatly into place. 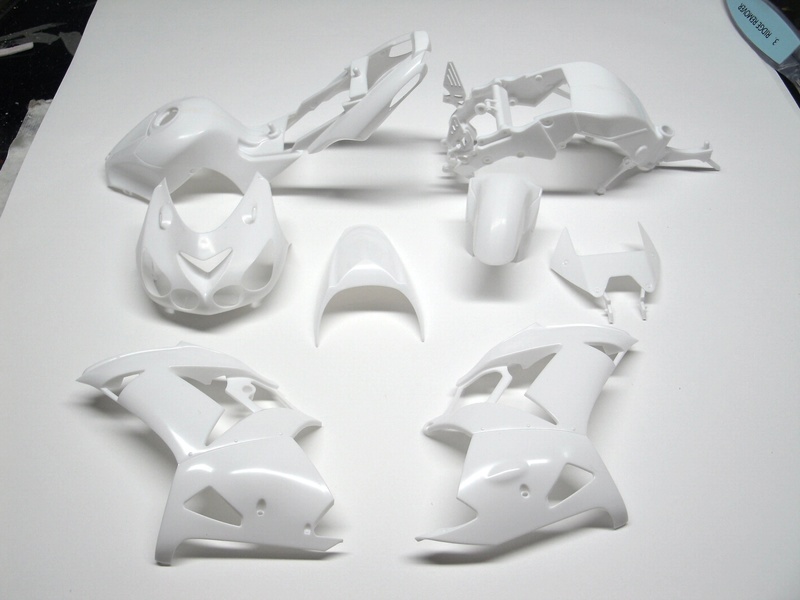 The initial assemblies have been painted and are ready to join. 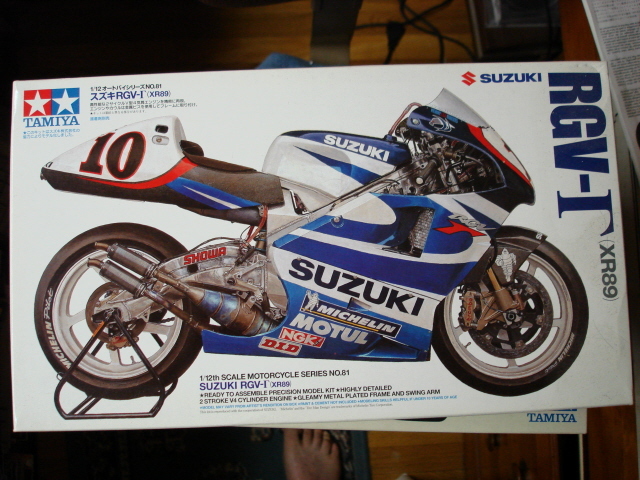 Fujimi added some good details for a kit this size, such as the exhaust and cylinder head. That's looking proper smart Cole. What scale is it? 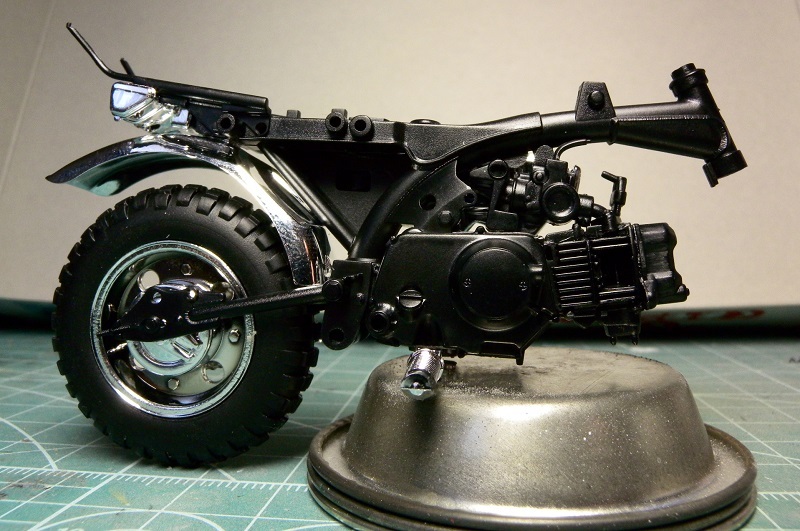 I'm just waiting for some Tamiya matt black to arrive to do the running boards on the 32, so have time to start on this one. The decals in the kit are somewhat yellowed and I should have had them in a south window ages ago.......... but I forgot!! Cheers Al; The Monkey is 1:12. 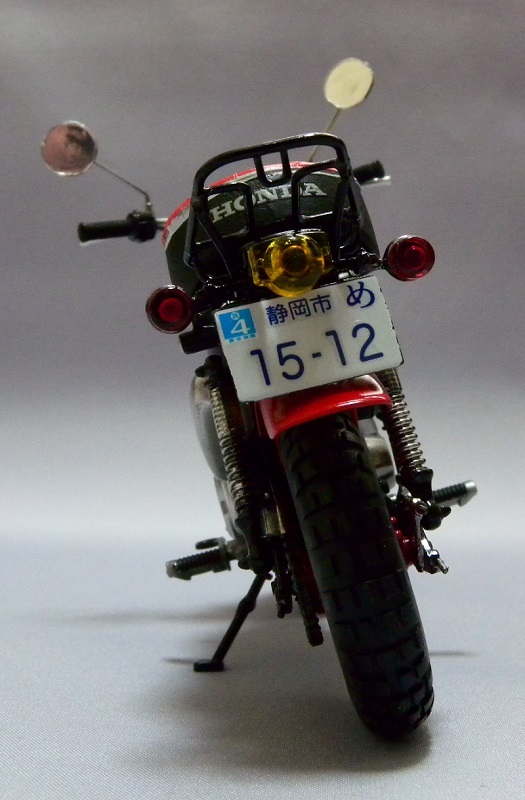 When finished, I will shoot some photos next to a full size bike. 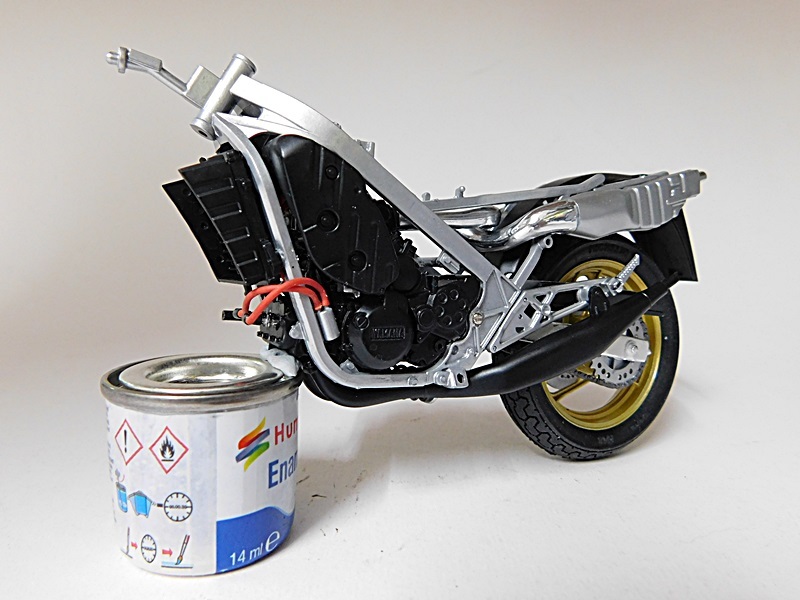 I am very pleased with the finish on the engine. 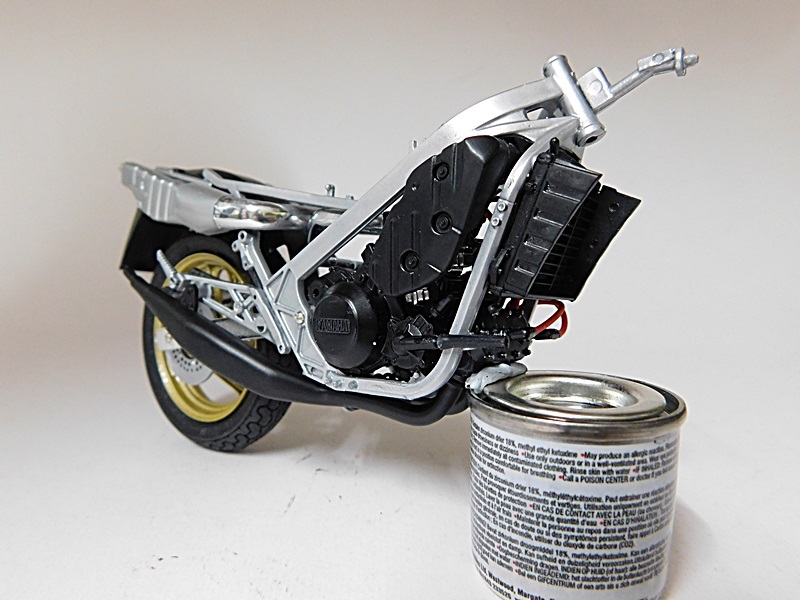 After painting the frame Mr. Color Black with a gloss coat or Mr. Super Clear, I shot the engine with Alclad polished aluminium. 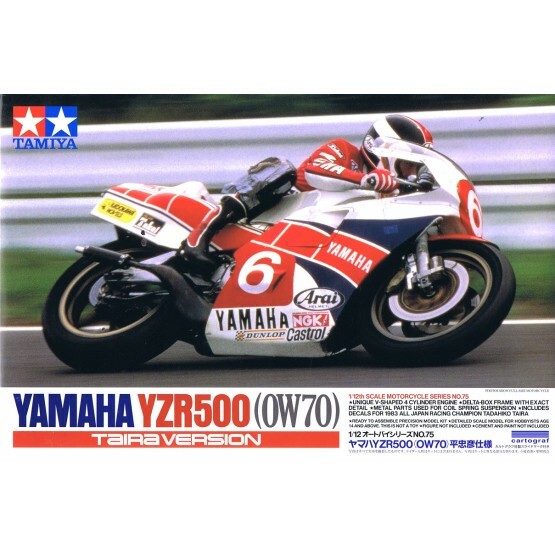 The exhaust cover and oil tank? 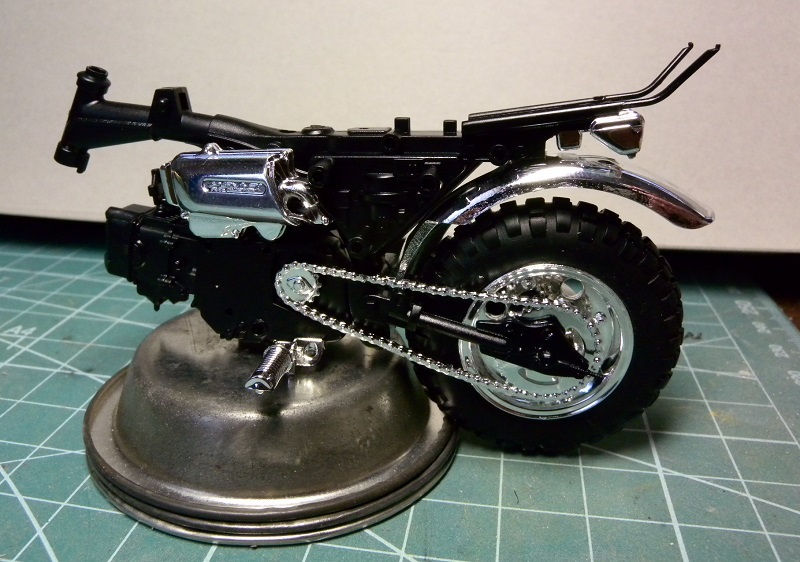 (on the drive chain side) are finished with Mr. Super Metallic Chrome Silver. 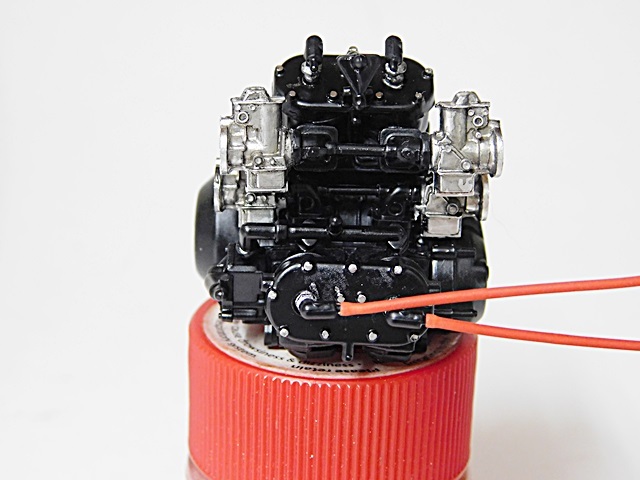 Fujimi has added some nice detail parts, wiring, and hoses. 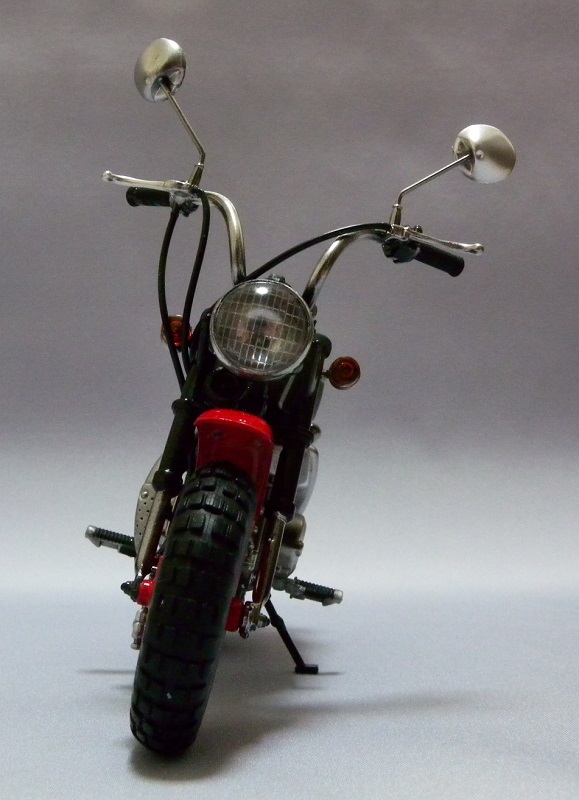 Some are quite small, such as the spark plug, coil, and shift linkage. Next is connecting the exhaust from the cylinder to muffler, then it's on to the tank and front end. Is it too late for me to join in on this one? Jump right in D.... the water is just fine. Thanks guys. I'd like to get this one done. The Monkey is looking great Cole. I love the shade of red you chose for it. 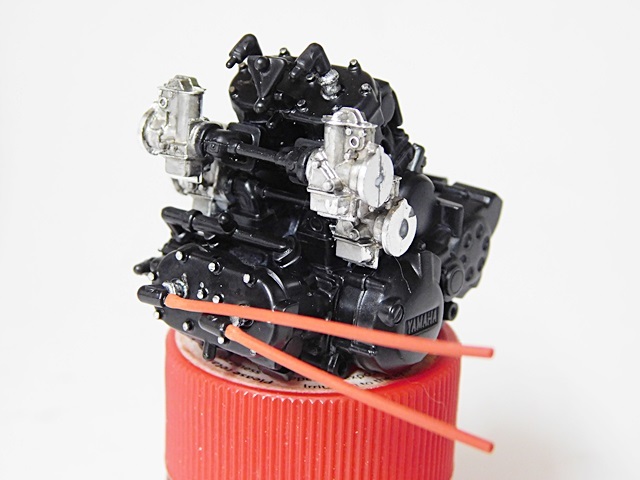 Tamiya calls for the engine to be done in satin black and matt black, so naturally I did it all satin black as most of it will be difficult to see anyway. 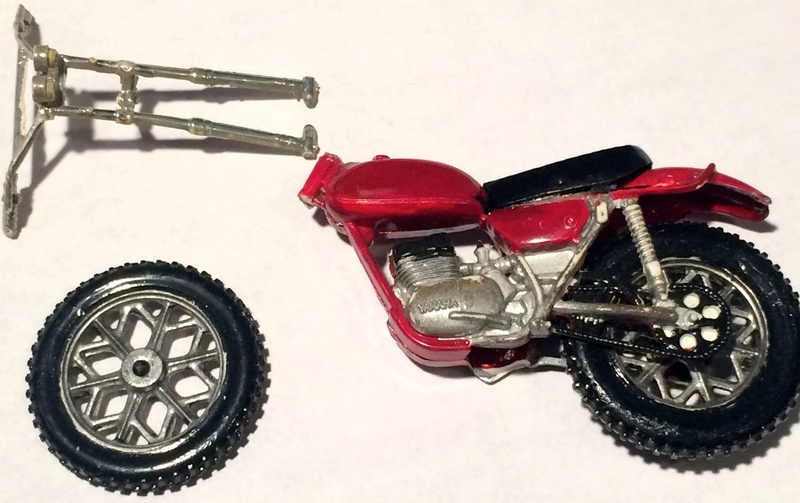 I did do the head bolts with a 1mm Molotow Chrome Pen and swapped the Tamiya black HT leads, for some red ones, to jazz it up a little. 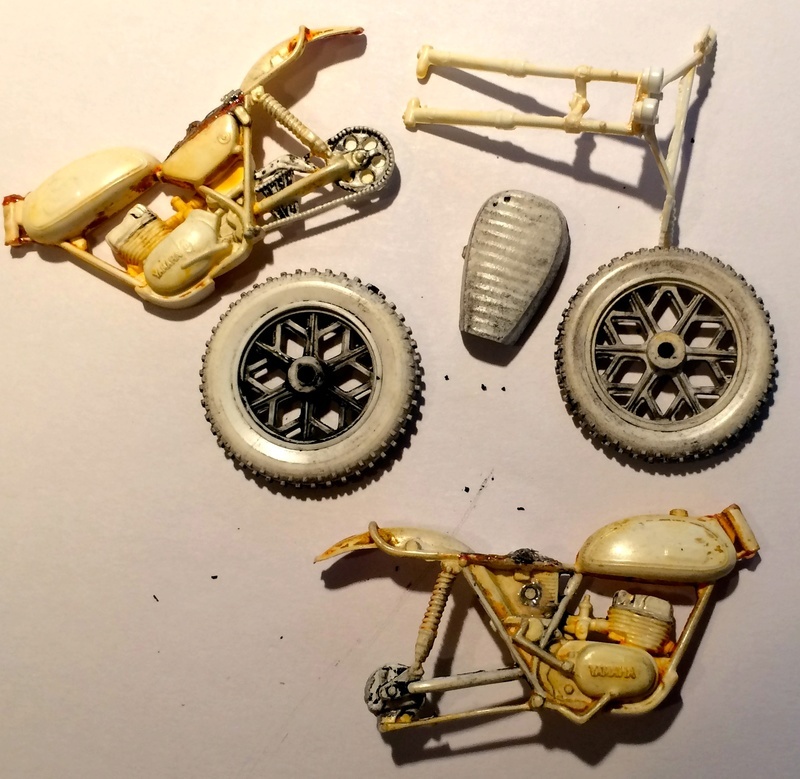 The carbs were way to shiney so I gave them a wash to tone them down some. WOW! 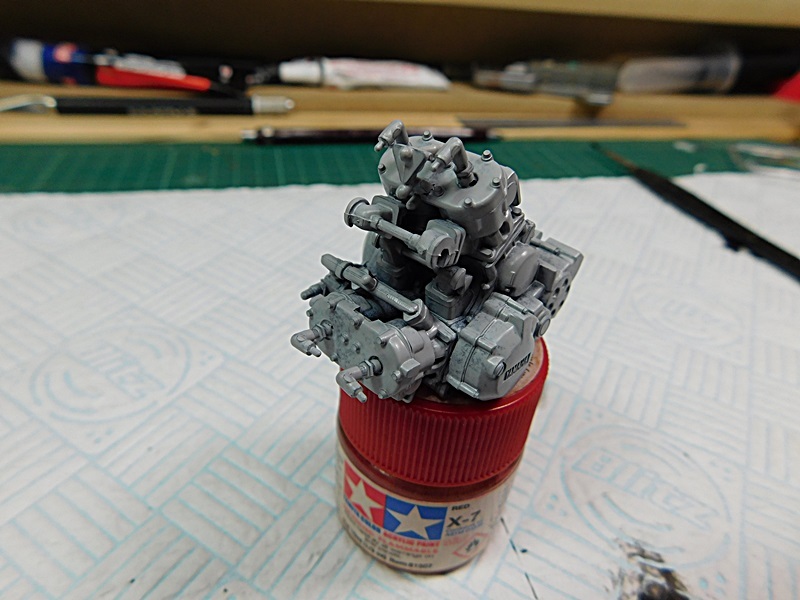 Some incredible build happening here. 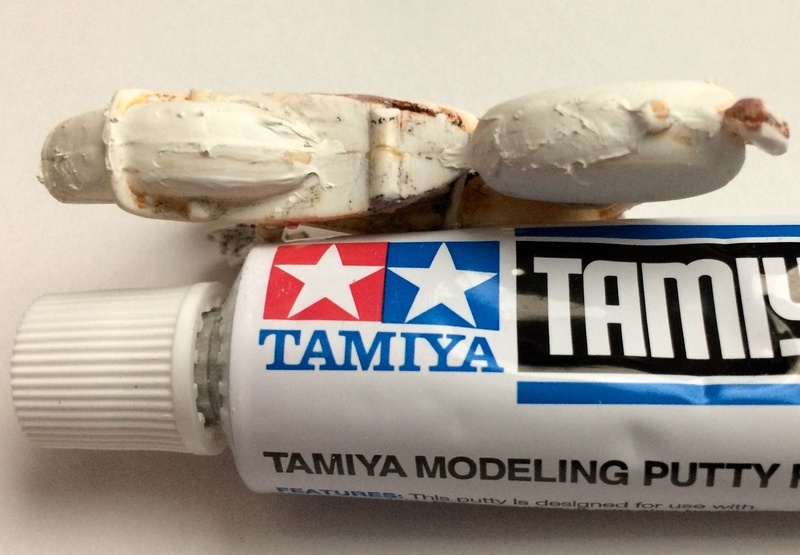 After stripping the paint and clean up, I filled the seams with Tamiya putty. 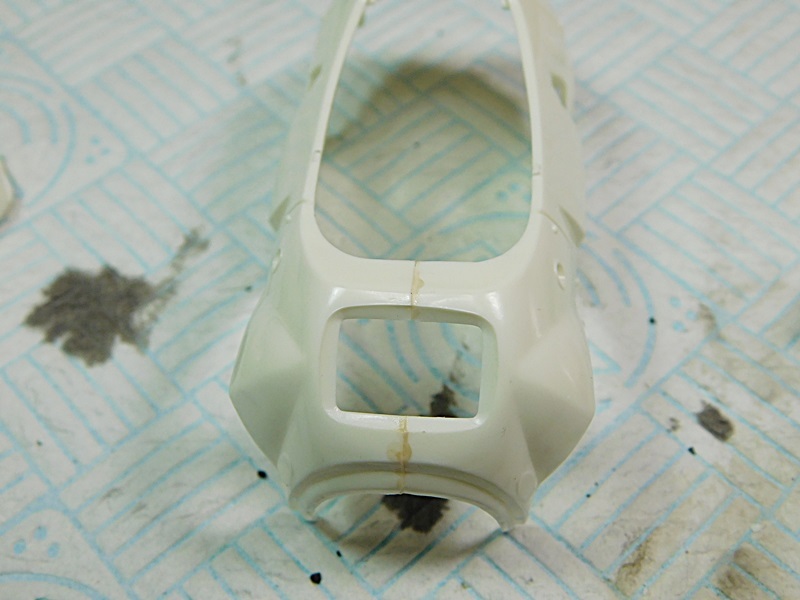 After attempting to rebuild the frame where the fork mounts, the plastic was too brittle and kept crumbling. 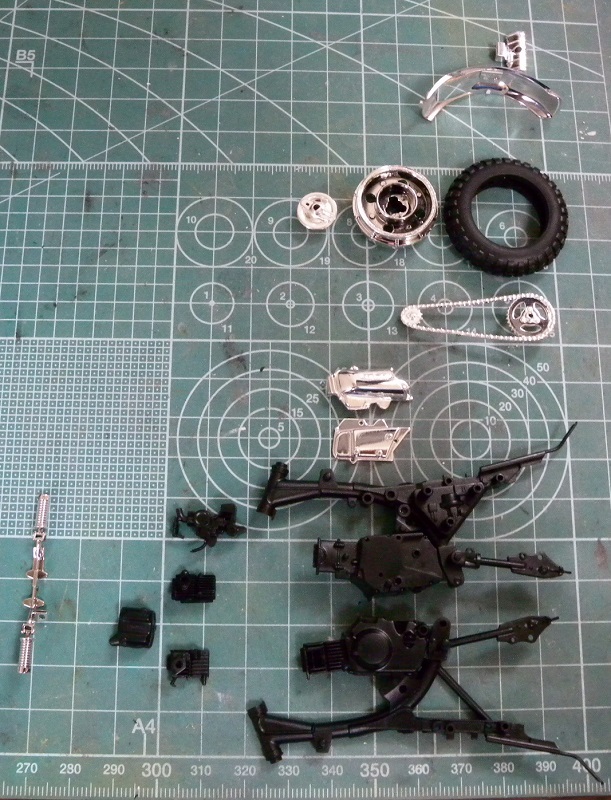 I molded in a piece of brass rod the shot the assembly in Tamiya silver. 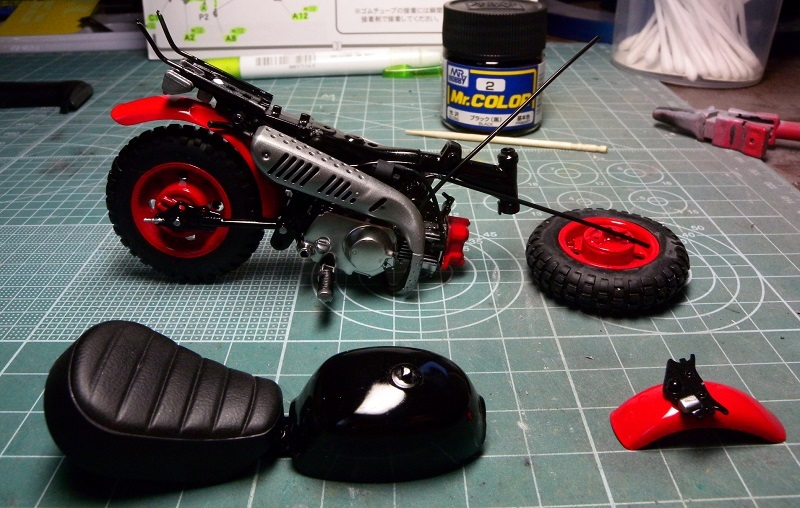 Finally, I used a combination of painters tape and silly putty to mask to paint the tank and fenders. Got the engine installed and most of the rear end done. I routed the two upper HT leads down to the dizzie and just tucked them in. 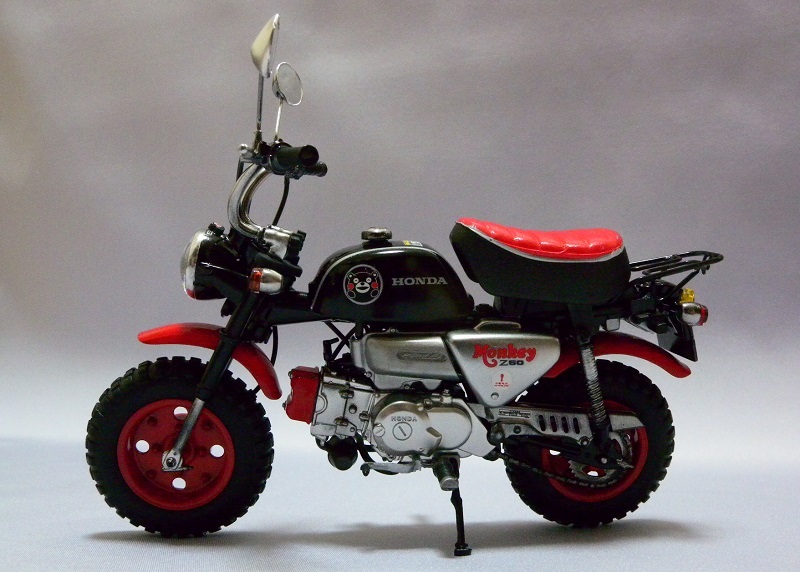 (instead of doing it Tamiya's crazy way). Needn't have worried though. It's all but impossible to see them anyway. 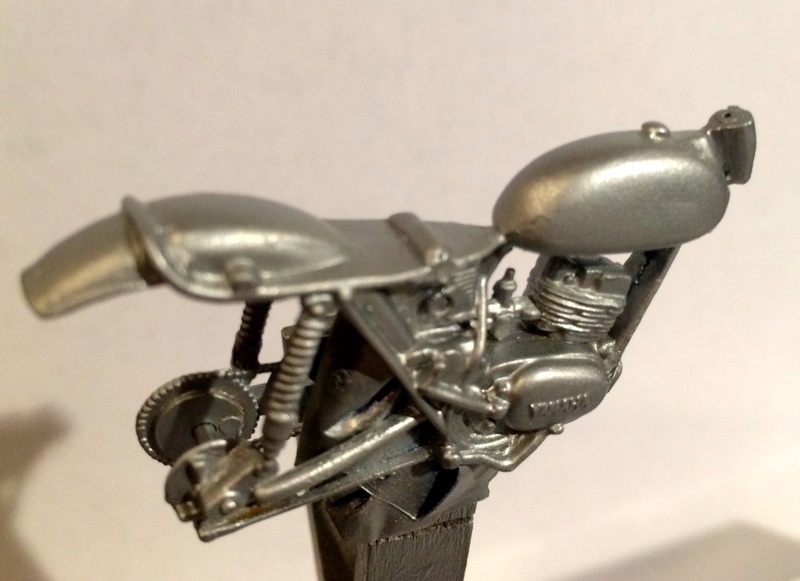 The upper manifolds to silencers were originally black and the colour call out was for Chrome Silver but I did them with a Molotow Chrome Pen instead. Chris: That is real dedication on your part. Al; Coming along nicely. 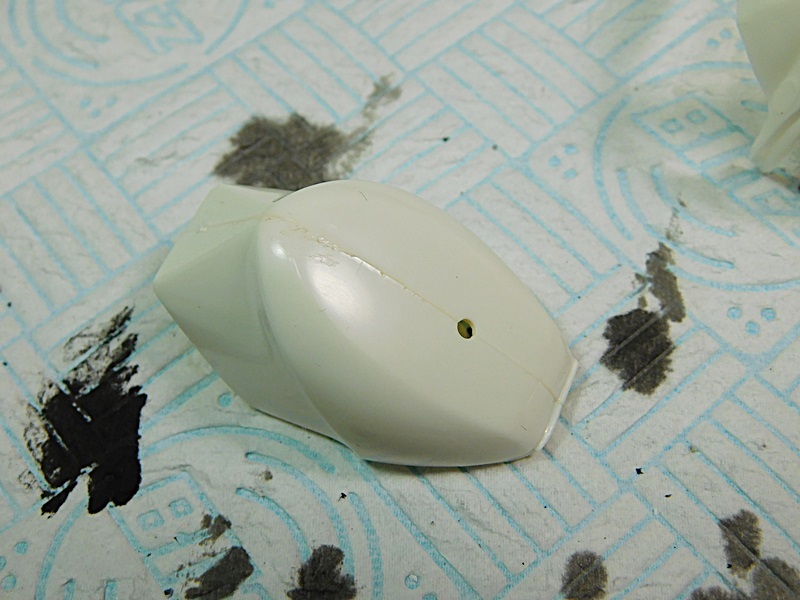 The paint for the fairing looks good. 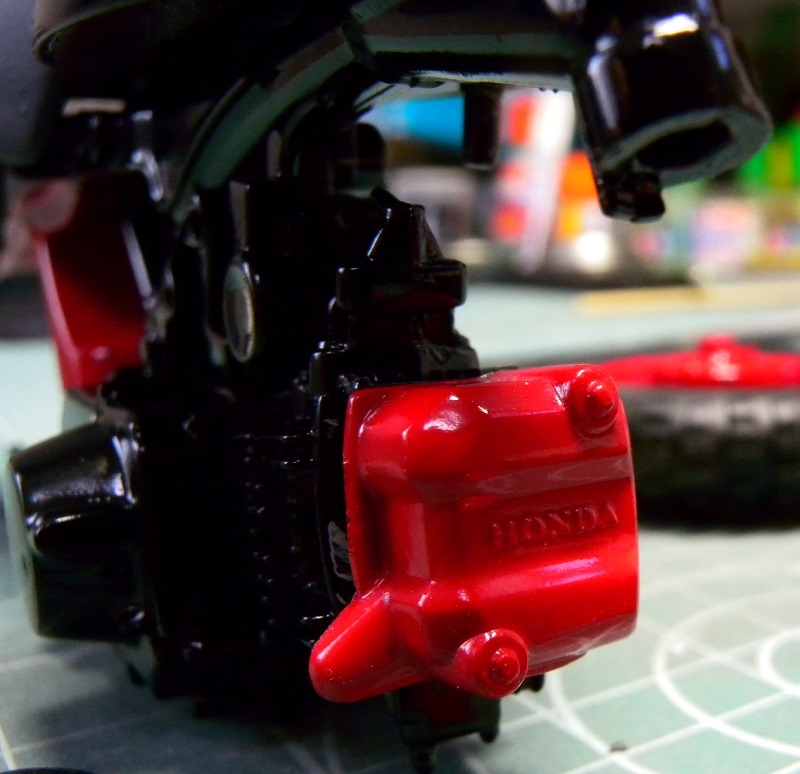 As for my Honda Monkey, I've made a bit more progress. The front fork assembly took some finesse, but is now attached to the frame. 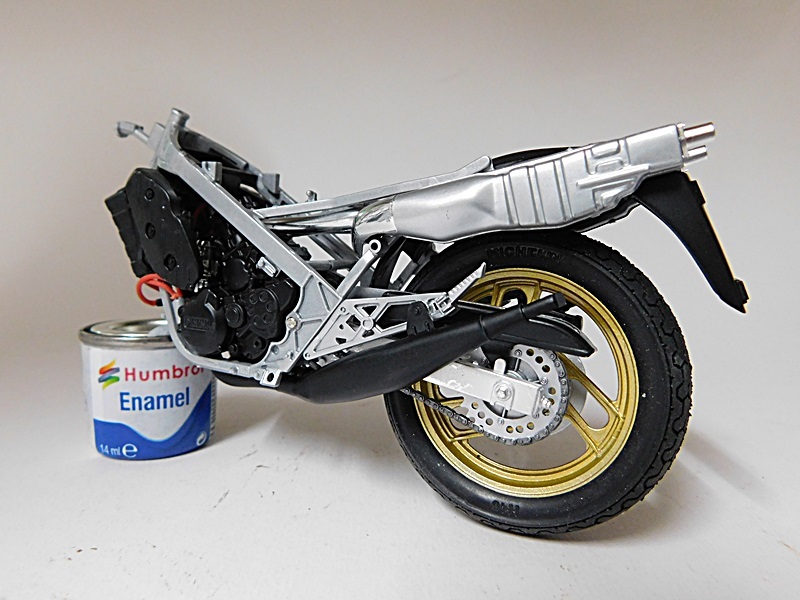 I've made a start on the Kawa. 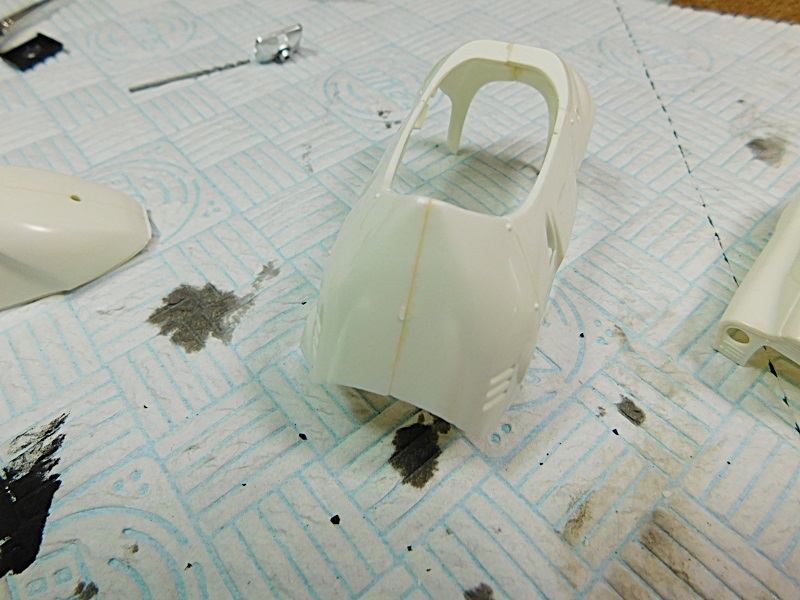 I've got all the body panels prepared and ready for a bit prime. 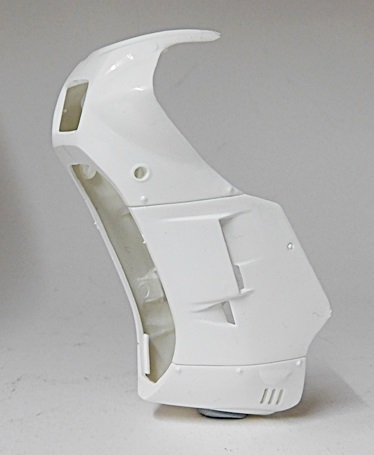 I must say not being a bike builder that I find the way the two halves of the body and the front wheel guard are split right down the middle making it a pain to get rid of the seam. Some horrible lines to sand. I think I have the seams flattened right. 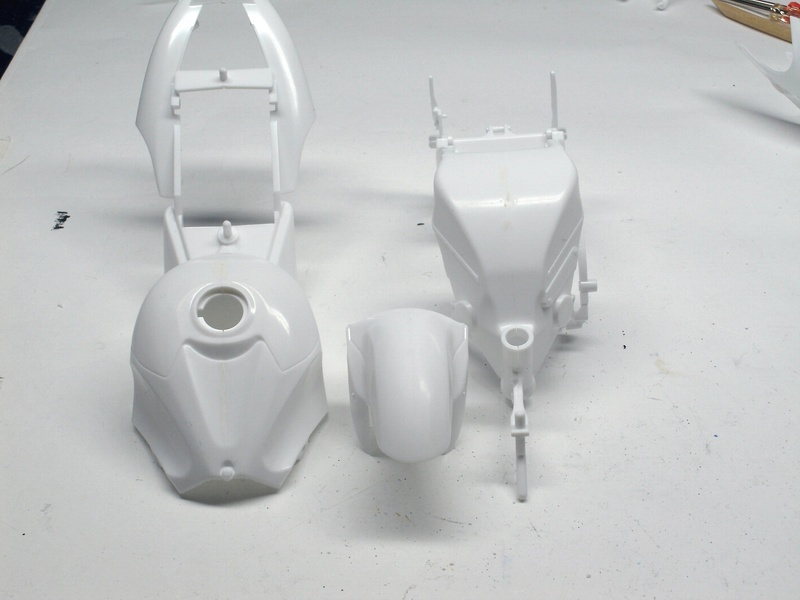 All body panels ready to go outside and be primed. 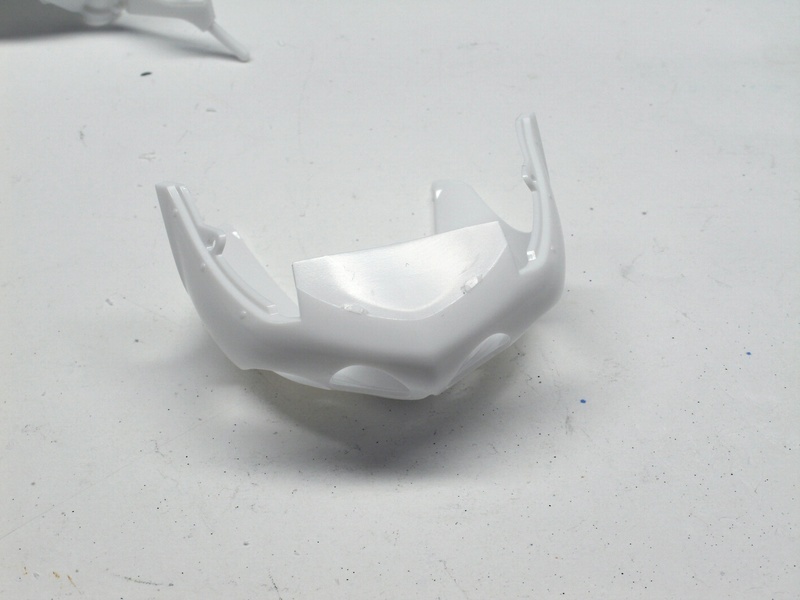 The colour I'll be using will be pure white and pearl clear. The monkey is now fully evolved.